The decidedly unfancy shark cage Casa de Chicas is assembled and waiting for a roof. It's meant to give the new chicas room to spread their wings, and to keep out stalkers and other ravenous chicavores. What it lacks in beauty and style, it makes up for in steel and right angles. 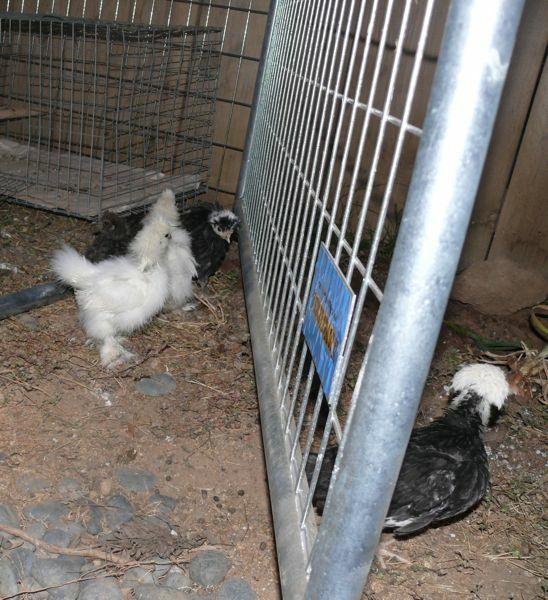 So, now the Polish sisters, and the Silkie Princesses, lil Puff and tiny Zoe are learning the ways of the great outdoors. Everyday we bring them from the heat lamp in the garage to the shark cage in the garden, and they love it. Love it. They scratch the dirt, redistribute the weeds, spread the seeds. 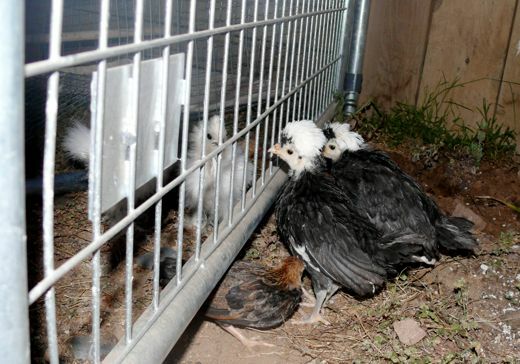 They enjoy their dust baths, which honestly look like ruffled chicken seizures. 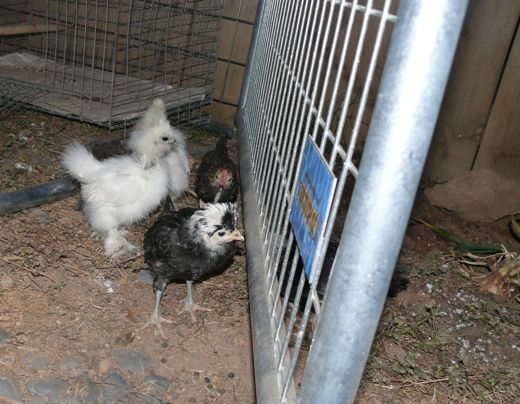 They spastically flap and roll and fan themselves with dirt and dust. A small, brown cloud hangs above them and every nook and cranny gets thoroughly dusted, then their flurry subsides for a moment and they look somewhat dead. But happy. But then something interrupts their blissful cycle. Now the frantic pipping commences. How does the poem go? They call back and forth to each other. They pace. They fret. Go in to the light… no wait! I would help them out, but how do you laugh, hold a camera, and wrangle chicas? "C'mon" says Tesla. "I've been to the other side." 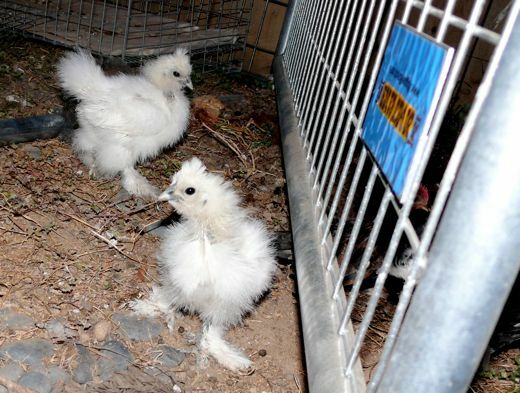 The fluffy feet of the silkies are so funny I can hardly type. So are you. The BEST show on earth-Chicken T.V , always a good laugh. 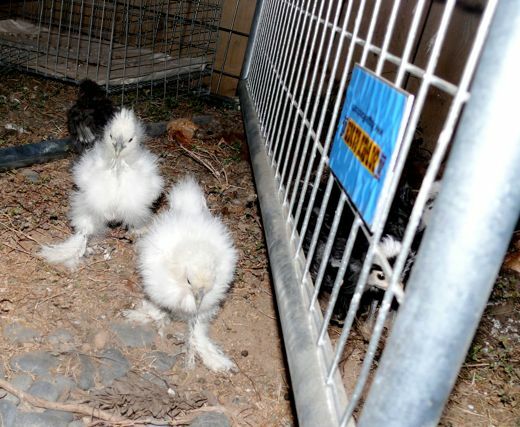 Funny thing we often use the phrase "Houston we have a problem" when we are talking about chicken craziness. This is great! I love your little chicas-they should come and play with my brother's little chicas! They would all have the best time! Hahaa, sounds and looks like so much fun. I agree about the fluffy feet. You'll have to post a video of the shenanigans.